Black Bears. Do you know what to do if you meet one? Yes, there are black bears in the Whistler corridor. In fact keeping them away from the Whistler dumpsite is a major problem. Once they find easy pickings in residential garbage they tend to come back for more. Fortunately, due to the many sightings over the years, the residents and powers that be in the Village have practiced good housekeeping habits thus almost eliminating things that attract these magnificent animals. Yes, black bears are beautiful creatures. Intelligent, curious, fantastic parents. As a rule, they do not want anything to do with humans. However, if food or garbage is made available to them they are going to dine on it. BEARS LOVE FOOD. ANY FOOD. A friend of ours, his wife and six children set out for a camping trip. They towed a utility trailer loaded with all the food they would need for the week they were going to enjoy. Arriving at the campsite they decided to feed the family after setting up the tents. They cooked the food outside and ate inside to escape the mosquitoes. It was almost dark when suddenly they saw a large black bear approach. It sniffed around the trailer where the food was stored. In seconds it tore off the little doors and ate all of their bread, butter, pies (his wife was a real cook). They watched as the bear would remove item after item from the larder, then sit on it’s haunches and dine in style. Irma and I have encountered many bears in our travels. Most people mistakenly believe that bears live in total isolation away from everyone. WRONG. Bears may live in cities (the state of New Jersey has a bear population of about 4,000 and that is one of the most densely populated states in the country. There are a great many bears living in the woods and hills around North and West Vancouver as well as along the Whistler corridor. Don’t let these facts scare you from visiting the wonderful hills and valleys here. When it comes right down to it, black bears don’t want anything to do with you as a person. Irma and I were camping near Kamloops, BC. I awoke about 7 am and left the tent to answer the call of nature. Not 15 feet from the tent was a huge bear moving pieces of firewood from the pile looking for worms and ants. I slowly made my way to the trunk of our car and removed my bear spray container I had there. The bear moved a few feet the other side of the woodpile. I picked up a large chunk of firewood and managed to hit it on the side of the head. It was tearing a tree stump apart and didn’t bat an eye. It then moved off to visit the next camp site. It walked behind the camper truck located there. I went around to the other side. I had my pepper spray ready. I stood by the back wheel and wondered where the bear went. Suddenly it walked out from the back of the truck not five feet from me. I sprayed it right in the face. If you ever think you can outrun a black bear you are sadly mistaken. That bear took off like a drag racer. The bad news was that the wind was blowing towards me and I was hit with the bear spray right in the face. No wonder the spray works so well on bears. It stung for a couple of hours. There are a few Grizzly Bears in the Whistler corridor. Generally they keep to the higher ground. Occasionally they may be seen along the Birkenhead and Lillooet rivers. These bears are much more aggressive and should be avoided. Be sure you read about these animals here. Here you will view over 800 beautifully detailed photos by some of the worlds foremost outdoor photographers. These wild and adaptable creatures live with us but keep their distance. Click on the photo on the right or left to view these magnificent photos. 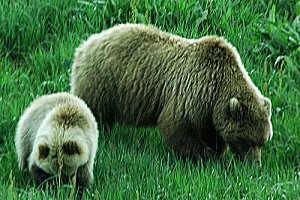 Of all the bear families, Grizzly Bears are the most unpredictable and dangerous. They will not hesitate to charge man or beast should they feel a threat. Even without cubs they cannot be trusted. When we travel the wilderness we always carry a can of bear spray just for this purpose. One precaution before using the spray, be sure you are upwind so you do not get the spray back in your face. Black Bears live for food. They need to put on plenty of fat to sleep through the winter. They will eat almost anything. If you are backpacking or tenting in a campground you want to secure our food. You backpack into a great site in the mountains. Set up your tent and relax. You should sling your food in a bear cache. An effective way is to put all of your food in a bag. Sling a rope up over a nice high branch of a tree. Now take the end of the rope and do the same to another tree about 10 feet away. Fasten one end of the rope. In the middle of the sling you want to tie the food bag and then tie the other end of the rope, removing the slack between the trees. Now the bear may smell the food. It may even climb a tree but if your sling is high enough your food will be safe. If you have driven to a campground in a car you should keep your food in the trunk of the car all the while. Not in the car but in the trunk. Bears are really strong and can rip open a car door from the top in seconds. Most likely they can’t do this to your trunk. Canadian Lynx is truly one of natures most beautiful animals. Googlle gallery has a mind boggling array of bears in every pose imaginal. NEVER KEEP FOOD IN THE TENT. If you are camping in a remote area, do your cooking at least 100 feet from your tent. Bears can smell hundreds of times better that humans. Keep them away from your tent. The last thing the bear wants is to meet up with you. If you don’t surprise them they will run the other way. The keyword here is surprise. Bears are very territorial. They don’t like intruders. They will fight other bears who enter their space because they feel that the intruder is trying to take over their territory. The same goes for humans who enter the bears space. If you do so noisily thus eliminating the surprise factor, the bear will normally run away. Make lots of noise if you are traveling through heavy bush. Talk loudly. Use a cooking pot and a stick if you don’t have a whistle. Any noise will alert the bear and lessen the confrontation. If you are at a remote lake and catching a few fish, keep your gad at least 50 feet away from you. Bears can smell food from amazing distances. If you come across a bear of any size or age, stop and slowly back up. Do not run at any cost. Running triggers an attack mode in the bears brain. If you are attacked lie down and cover your head. The only vulnerable area on a bears body is it’s eyes. If you can get your finger into an eye or better still, both eyes, your chances of getting away greatly improve. You will need to blind the bear. Dig in with your fingers. It will let you go. It’s your only chance. If you carry bear spray, carry it in your hand while in bear country. Make sure you know how to remove the trigger guard. It is effective but only at short range. The good news about black bears is that they seldom attack humans. If they do they are either protecting their cubs, their food, they are surprised, or they are sick and too feeble to find food.